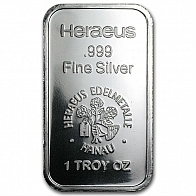 Each bar contains one troy ounce of 999 fine investment grade silver bullion. These bars are manufactured by Japanese company Asahi, who recently purchased Johnson Matthey's refining business. 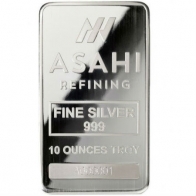 Each bar features the Asahi logo at the top, with the weight, fineness and serial number below. These bars come individually sealed in plastic to prevent damage. 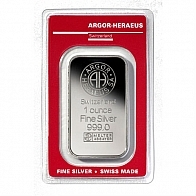 Asahi silver bullion bars are available in 1 ounce, 10 ounce, 1 kilogram and 100 ounce sizes to silver investors. Asahi also make a 1 Ounce gold bar for individuals looking to buy gold bars. All Asahi items are available for VAT-free Swiss storage to clients worldwide.